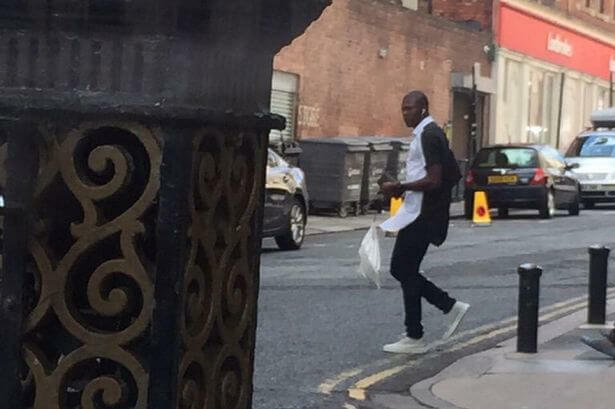 It looks like Chancel Mbemba has arrived in Newcastle and he is booked into the Hotel Indigo on Fenkle Street. It looks like it was Newcastle fan Scott Hunt – a manager at Bonbar, who got the first photos out – well done! The Bonbar bar and restaurant is also on Fenkle Street in Newcastle. It looks like its him and the 20-year-old central defender arrived in a similar type Mercedes that greeted Georginio Wijnaldum at the airport, and was photographed both entering the hotel lobby, before exiting again and leaving ten minutes later. 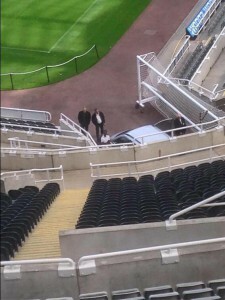 Here’s a photo of him at St. James’Park. If all goes well Chancel will be introduced tomorrow as Newcastle’s 3rd new signing this summer, and will cost £8.5M from Anderlecht. That will take Newcastle’s spending up to £35.5M so far this summer, and according to head coach Steve McClaren more on their way. Great stuff keep them coming. At least two more ! I hope Cancel Mybimbo is a decent CB like. Yes! Joao Mutinho is coming Zangwill!!! Then he’s leaving again…. I always enjoyed your articles good to see you back. Articles or players Jail ? I only have one complaint about this article. It’s too long….too wordy…. Let’s just stick to the facts and cut out all the colourful phrases and rantings and ravings shall we? Harrumph. Is that NUFC you said were unknown in the U.S? I can guarantee you that’s not the case. There were quite a few meet ups for the games from American born fans. Me included. Plus Sacramenro, where I live, is a fast growing soccer city and one of the most culturally diverse cities in the country, so definitely not just your American football, nascar types! Now that we have completely amazed and overwhelmed the Americans with wor famous Tour of 2015 we should be planning a tour elsewhere for next summer. Somewhere absolutely essential to the football world….Hmmmm. Possibly Burundi and Uzbekistan would do the trick. I believe you 89Norcal mate but in the grand scheme of things it wasn’t us being televised playing games against the Galaxy and Red Bulls was it? In fact it was kind of pathetic when compared with what many Prem teams are doing this summer. That was my point. Strange…not sure where your disdain for the tour is coming from. It was a much mbetter choice than last summer though. Too bad thr team couldn’t deliver much spark! Our 2nd CB?? This guy would be a hell of a signing if we can get him. What a CB pairing we would have with him and Mbemba!! Wasn’t televised but I imagine that’s the se story for most teams without silverware to their name wasn’t it? I saw on youtube there were 5,500 or so unique viewers watching the Sacramento live stream, plus the sold out stadium and numerous pubs in california. We gotta be realistic considering our performance last season. My disdain is coming from the fact that we couldn’t even organize a game against the Portland senior team and we couldn’t beat the B team because we didn’t like the pitch so we fielded a ridiculous starting 11. Also who plays a Mexican side in Milwaukee? If we wanted to play a good Mexican side why not play them in Mexico? I’m not disdainful of the team or players I just think whoever organized the tour is an idiot. You got to see them in Sacramento but that doesn’t make it a headline grabbing trip. The club were absolutely invisible over here as far as sports networks were concerned. Just a thought. 5,500 unique viewers from a North American population of about 450 million Norcal mate? Ahahahahahahaha!!!! Not really excited on this one as it’s trawled on and on. We all knew he was coming in. The next signing on the other hand is the one I’v been waiting for! We’re not even a pimple on a goat’s left testicle in North America sad to say. Thanks to the amazing Ashley who has made us what we are today…..pathetic that is. Who is the next signing Toon Prodigy mate? After Cancel Mybimbo I mean? The U.S. Tour is coming off the back of a nightmare season and to be fair with the other clubs that are over there we are hardly a big draw for the networks are we! Well there’s your naiveté showing. We nearly got relegated, our fan base despised our manager and owner, we were hemoraging talent, we couldnt beat a USL team without an own goal, we lost to a b side, and you want us on summer TV like Man U and Barca. norcal is it true SD are opening stores in your neck of the woods ? I should say Geordie that your comments mirrored the toxic NUFC supporters on youtube, who were more keen on bashing the “yanks” (despite never having met one) than watching the game. Aye that’s what we’ll have to do JackButler. But why the Ashley fascination with screwing up North American tours? The previous one was pathetic and cost us a couple of serious injuries. It just doesn’t make sense to waste time on poorly researched trips over here. Go to countries with real interest, play good teams, advertise properly etc. etc. You know like proper professional clubs do? West Ham can do it over here, why can’t we? I have to agree to some extent with G2 on the issue of the American Tour. If there was any genuine forethought, they would have made stops in larger markets than Milwaukee and Portland. It is tough to raise a club’s overseas profile if the only people that know about the tour are those that follow the club anyway. I believe that the tour was cobbled together at the last minute an certainly after prem survival was attained so it all just comes off as a weak effort. Better to have stayed at home. I agree with you to some extent but Chelsea’s game yesterday was also against an MLS second team (NY Red Bulls). They just didn’t call it a second team even though it was. The reality is if Newcastle doesn’t get chosen for that International Champions Cup, games aren’t going to be on TV. The best second option is still to go to the states and build up the fan base that way. Hopefully by next summer Ashley has loaned some money to the International Champions Cup promoters as a way of getting NUFC into the tournament. Good comeback Norcal mate @25. I think the naïve one was Ashley when he bought the club. And sadly for us he has stayed that way. Although he does seem to know how to make money out of us while he’s humiliating us. Food for thought, but I think the supporters have known it for a long, long time now. About 8 1/2 years in fact mate. Its very clear what G2 means. 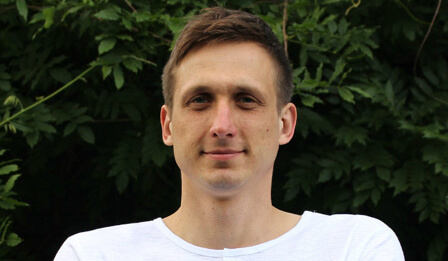 He wanted a better otganised tour more suited to a team that was almost relegated. Trailing all the way accross the Atlantic to put out a c-team against the New Lettuiceburg hamsterlungs on pitches made of sh1te is hardly good prep. He was using the TV figures as evidence of poor organisation. Looking forward to finally seeing a centre half come through the door after 3 years of wailing. We should be going all out to sign Abdennour. Another quality Centre half is absolutely paramount. But after that I don’t know if I’m the only one here, but can anyone say we have an actual First team quality out and out winger?!? Cabella is not totally a wide man, and struggled last season, his end output is poor. Aarons should be the young backup. Obertan is Obertan. Gouffran is not worth the price of his unused boots. Sissoko is the only option and even he is not totally a wide man. So the need for one is dire.